Today afternoon, I visited elderly with my classmates and some S4 students. I think it was a meaningful trip for me because I can talk to them and know the elderly more. When I first walk to their home, I saw the stairs were shabby and the aisles were very dark although it is sunny outside! But elderly people still need to live there because they don’t have ability to buy other flat. While I just walk up stair to the elderly home. In the elderly home, there is no air-conditioner! It is very hot in that time. The flat is old so the elderly don’t want to spend money to fix the air-con. I think we should care elderly more after visiting them. After this activity, I have learned that he should help the elderly more often. The elderly seem like needing more help. They were difficult to move, having many sicknesses and in a hard condition to live. Although I couldn’t talk with them or anything but I felt that they were lonely. If I could speak Chinese, I could have talk to them actively. While the senior students were filling the questionnaire and asking questions, I really didn’t know what to do so, I just looked at them and smile. I really enjoyed the actively and wanted more chances to be with them. It is good for us because we can help them and also get service hours by doing this. The school should make more activity like this and encourage students to care the elderly. I wanted to help them after I grow up. I wanted to improve their living area. They even had no fans to cool themselves in the summer time. Even we were sweating while we were with them. I knew that I am in a very good condition to live with my care of my parents. I should study harder to make my parents to live in better condition when they become old like the elderly I met. I experienced the way how elderly lives, learned through their personalities or hobbies. In the elderly’s room, it is old and hot, because there is no air-conditioner and they lived there for a long time. Although it is a bad condition, we learned that they depends on their son/ daughter to lend money to them, otherwise they cannot find food/ shelters. I experienced and learned they cannot afford much; they lived in a small house. But we ask them, are your living conditions good, they said yes. So I am not sure if they like to love in a small house, but because they have enough money and they have a strong ability to walk, so they can walk anywhere they want. Finally, we gave a small little gift for them. This activity was really meaningful as I got to visit elderly and give them nice gifts. It is really sad to see the truth that there elderly live in a really tiny apartments. In my opinion, the government needs to spend more money on people like them instead of more businesses. The first couple we visited shared fairly short answers. But the other grandma was very cooperative and gave us longer answers. She had so many toys in her apartment! It was also very fun to hang out with our helpers, Cindy and Fish. When we finished the first visit, they forgot to take the dumpling back with them! Being a non-Chinese, I found it quite hard to communicate, so I kept my mouth shut and listened to their conversation instead. Surprisingly, I could understand most of their words. And the second grandma had bought sweets and told us to have. Anyway, though it may have looked tempting, we politely refused. This is a lovely experience and I look forward to do it again. In this time about the elderly visit, I experienced that the elderly’s home have no air conditioner so their home will be very hot and their home are not very big and not many appliances in their home. We ask them some questions about their living habits, for example what will they do, eat and others. There also have lift so they can go out their home easily but one of them had hurt his backs so he cannot always go out. In this time, I learn to communicate with others and to know nowadays what did the elderly’s home have or what it look like. Although the place is dirty and many insect but the elderly are not mind and scared. I hope I can visit the different elderly next time because I also want to know more about them. And also give them food or some needs that can help her in their daily use. I experienced and learned a lot through this community service activity. This is the third time for me to visit the elderly in my secondary school life and it is also my first time to be the leader to lead junior forms students to visit the elderly. My group had visited two old people. Both of them are female and they are very kind. They were very sociable and talked with us. They share their daily lives and difficulties that they faced. They were very glad that we visited them. They liked the dumplings that are given by us. In this activity, I have learned how to talk with the elderly and guide junior forms students to ask questions. I have learnt to be a good leader and more sociable. To sum up, it is my pleasure to visit the elderly and I hope more elderly visit will be held so that more elderly can be held. In this activity, I was helping the form 1 student to visit the elderly house. Before the activity, I thought that I will not have fun or I cannot communicate well with the form 1 students because they are all Chinese in my group. During the activity, I enjoyed communicating with the form 1 students because they were fluent in speaking English and they are keeping the conversation alive. However we thought that we won’t able to go to the home we were assigned to go to because when we call her something happen. We were about to go to another group and join them. But then she came down already to meet us. Then live on the 8th floor without lift. I wasn’t used to it because we live in a building with lift in it. They were kind to us they also didn’t want to get the gift we got them. I never thought that I would enjoy this activity and I learned how to respect the elderly more than before. Today, I have learnt how to be a good leader. Since I cannot find the way of going to the elderly’s home, I asked my group mate in order to find the right direction. I found that cooperation with others is very important. Nevertheless, as it is not an easy job to handle the leadership work. I feel tired of this task. But then I found visiting elderly’s home is a meaningful job. I hope that I can participle in the same kind of activities in the future. It can help the others and also warm my heart. A little effort enjoy can lead to a great inspiration to them. I don’t enjoy leading others but then I love to visit the elderly. During our years in the junior form, we would visit the homes of the elderly, chat with them, ask questions and show care. But this year, we assisted Form 1 students to visit elderly. We were expected to find the location of the elderly’s home by ourselves using a map and watch over the form 1 students as they attempt to communicate with the elderly. I quite enjoyed being a helper. It was an experience and it took a while to find the address of the elderly. The elderly we visited were nice and approachable. After calling them to tell them we were here, they were standing outside their flats to help us find them. My group members were helpful and took the leadership role. The form 1 kids were such newbies as this was their first time although I couldn’t understand Chinese, time spend at the home of the elderly was quick. After this activity, I have experienced about how our live could be when we grow up, I found out about the difficulties the elderly face their demands towards the society / government, I have also learnt how to communicate with them in an easier way as the younger generation. I think we can help them from different aspects. I also realize how difficult life gets and how much smaller the solutions show up to be and that’s the reason why. The society has to bring some solutions to solve their problems because they can’t depend on anyone else. Through this community service activity, I have learnt to communicate and respect each other; also, we should try our utmost, do things we like as Koko. She has disease after she have fever when she was young, but she didn’t give up. She draws views nowadays everywhere. 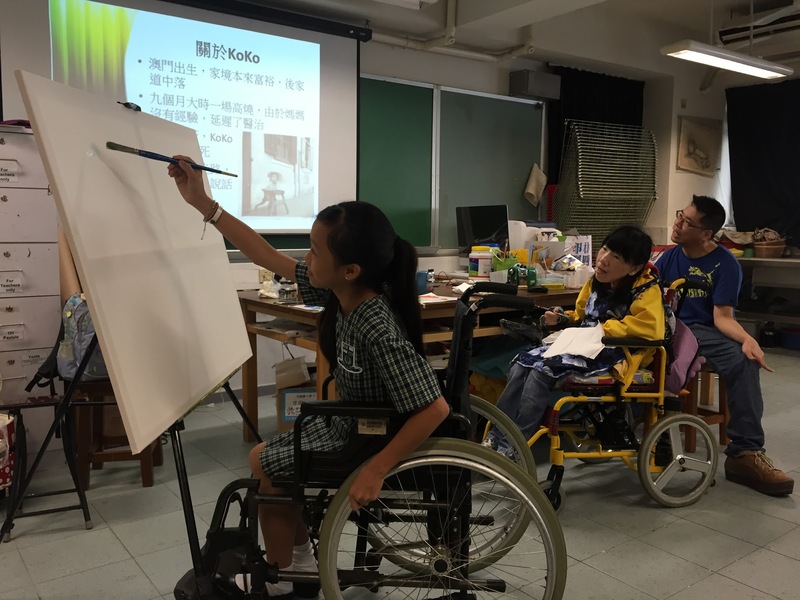 In this activity, we done a drawing together, for the first one, I tried firs, it’s hard to draw with sitting on a wheelchair, I understand that Koko really tried hard and she love drawing very much, she have a very strong willpower. Everyone should learn from her, we have healthy body, money and time, we should use them correctly, spend them on things we like. Through this activity, I learnt that something you can’t do is just because you are not willing to do. If you are willing to try and keep working on it, you may be able to get good result. The guest comes today, Koko, is a good example. Koko is a serious congenital defects patient. Surprisingly, she doesn’t give up. She is now an artist and writer. Koko’s condition is bad; she cannot walk and swallow food. She can talk but not clearly. She can only move her hands a little bit not easily. I think her positive attitude, self-confidence and persistence is the wheelchair to drive her all the way to her goal as an artist and writer. Koko obviously shows us the difficulties or obstacles can’t prevent us from expressing out potential. If we are brave to step forward, keep going and work harder, everybody can make their dreams come true. After meeting Koko today, I shouldn’t have any excuse to escape things that is good for me. I should treasure the capability and talent that I have and make use of them in the right way. I am Ocean Chan from 4F. I am a student pilot and also a member of the Hong Kong Air Cadet Corps. Each year, the Hong Kong Air Cadet Corps organizes a pilot training course for 30 members. It covers all the subjects that a student pilot needs to learn about. After passing the written test, a flight simulator test and an interview, 7 students went to New Zealand for the flight training. I was lucky to be one of them. The school always supports students to take part in different kind of activities. I would like to thank the Hong Kong Air Cadet Corps and the school for offering me this great opportunity and help me get one step closer to my dream to become a pilot. I am looking forward to meet you in the sky in the future.